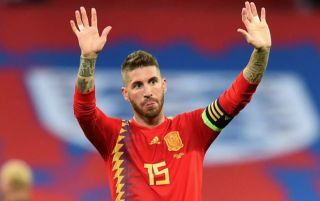 Sergio Ramos took to Twitter to confront those who have been criticising him for allegedly stamping on Raheem Sterling during England’s win over Spain on Monday. Following the match, videos appeared on social media that seemed to show the Spain captain stamping on the England winger’s leg during the second half in the Three Lions’ 3-2 win over La Roja earlier this week. This then prompted a whole host of fans to slate and criticise Ramos, however it seems like they were too quick to jump to conclusions regarding the incident. On Wednesday morning, Ramos tweeted out a video of an alternative angle of the situation, with the caption ‘nothing more to say’. The new video appears to show that Ramos didn’t make any contact with Sterling, with it seeming like the Man City winger was acting/diving in order to try and get the Real Madrid star in trouble. This new video makes Sterling out to be in the wrong and not Ramos, something we’re certain a lot of fans were sure wasn’t the case when the incident first occurred. Here’s a clip of the incident in Ramos’ tweet, one that seems to put a lot of people’s original opinions into doubt.